In September 1938 just a year before the outbreak of World War II, Alfred Wainwright made a solitary walk through the Pennines. Always the author, he wrote a book about his experience which he titled 'A Pennine Journey'. The book was not published until 1986 long after his reputation as a guidebook writer of extraordinary talent was established through his pictorial guides to the Lake District. A lot has changed since 1938 and we are fortunate that a team of volunteers from the Wainwright Society led by David Pitt, have laboured long to devise a modern route which as near as possible follows Wainwright's original Pennine journey, so now you can also follow this excellent route. 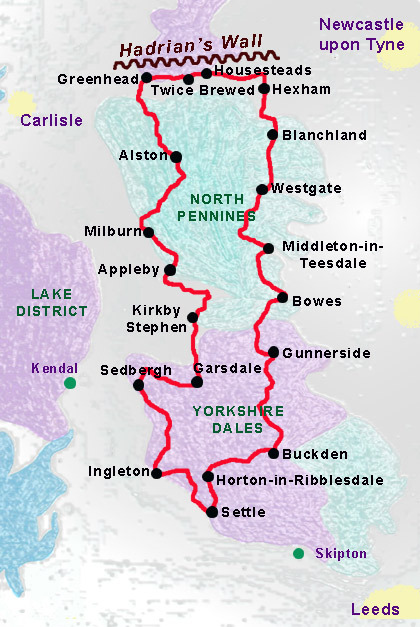 This itinerary for the Pennine Journey, splits the route into 18 stages with a daily mileage mostly between 12 - 17 miles and three days of around 7 - 8 miles. We are always happy to chat about the route and can quote for longer or shorter periods. Arrive Settle and check in. * The short Day 10 allows time to explore nearby Vindolanda in the morning. (T) indicates that a transfer to or from your accommodation (included in the price) is required. This is our suggested itinerary for completing the Pennine Journey, over 19 stages. It is similar to the above 18 stage trip except the two long (17½ mile) legs from Buckden to Bowes are split into three more comfortable distances. We are always happy to chat about the route and can quote for longer or shorter periods. * The short Day 11 allows time to explore nearby Vindolanda in the morning. (T) indicates that a transfer to or from your accommodation (included in the price) is required. For those that do not have the time to follow Wainwright's first Pennine Journey in one continuous holiday, we offer the route in two halves. The Eastern half takes you through the Yorkshire Dales via Horton and Swaledale. You will pass England's highest pub before crossing the Tees Valley at High Force and then North Pennines to reach Hexham and beyond to Hadrian's Wall. (T) indicates that a transfer to or from your accommodation (included in the price) is required. The Western half of the Pennine Journey is slightly tougher than the Eastern section as there is a fair amount of accumulated ascent and descent. It is also completed in one day less than the Eastern half due to the scarcity of overnight halts along the route. This section begins with a walk along Hadrian's Wall before following the South Tyne valley through Alston to Garrigill. 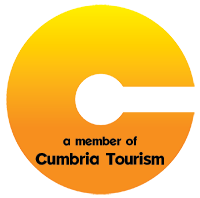 A traverse of Cross Fell brings you to Appleby, from where the River Eden leads through Kirkby Stephen to the remarkable limestone scenery of the Mallerstang. Finally, you will climb over Whernside and Ingleborough to end your Pennine Journey in Settle. Arrive Once Brewed and check in. For those that do not have the time to follow Wainwright's first Pennine Journey in one continuous holiday or even in two halves, we offer the route in three sections of 5 to 7 stages. The first (southeast) section is from Settle to Westgate via Horton, Swaledale, Tan Hill, and Teesdale. Arrive at Settle and check in. This 7 day northern section begins in Weardale with some delightful riverside walking to the attractive village of Blanchland. Crossing the Tyne at Hexham you will pass several forts and castles associated with Hadrian's Wall before heading south again and tackling Cross Fell to reach the charming market town of Appleby. Arrive at Westgate and check in. * The short Day 4 allows time to explore nearby Vindolanda in the morning. (T) indicates that a transfer to or from your accommodation (included in the price) is required. On this 5 day section, after passing through the Howgills you enter limestone country where you can enjoy the spectacular scenery and generally dry underfoot conditions associated with this geology. This section of Wainwright's Pennine Journey includes ascents of Whernside and Ingleborough as well as beautiful Dentdale and visits to the towns of Kirkby Stephen, Sedbergh and Ingleton. Arrive at Appleby and check in. SETTLE: Settle is easy to access and is connected to the main rail network via Skipton and Leeds with frequent trains. It is also a terminus on the scenic line running from Carlisle. WESTGATE: There are frequent buses to/from Westgate via Stanhope from/to Bishop Aukland or Durham. APPLEBY: Appleby is a stop on the scenic Settle to Carlisle line. There are trains from/to London Euston via Carlisle or from/to London Kings Cross and Manchester via Settle and Leeds. The journey time from London is approximately 5½ hours and from Manchester is 3 hours. The 247 mile 'Pennine Journey' traces a circuit from Settle on the edge of the Yorkshire Dales, first tracking north over the hills and dales of the eastern side of the Pennines. It then heads west, following Hadrian's Wall over the many undulations of the Great Whin Sill, before heading south again down the western side of England's spine, including in this section, ascents of Cross fell, Whernside and Ingleborough. Only slightly shorter than the Pennine Way and probably tougher, the Pennine Journey is a superb route that deserves to be recognised.